Green Bay started out with the ball. They moved down the field with ease. The Dolphins secondary were playing off the receivers and Aaron Rodgers made them pay with a touchdown pass to Jordy Nelson. After a great return by rookie Jarvis Landry the Dolphins started in Green Bay territory. 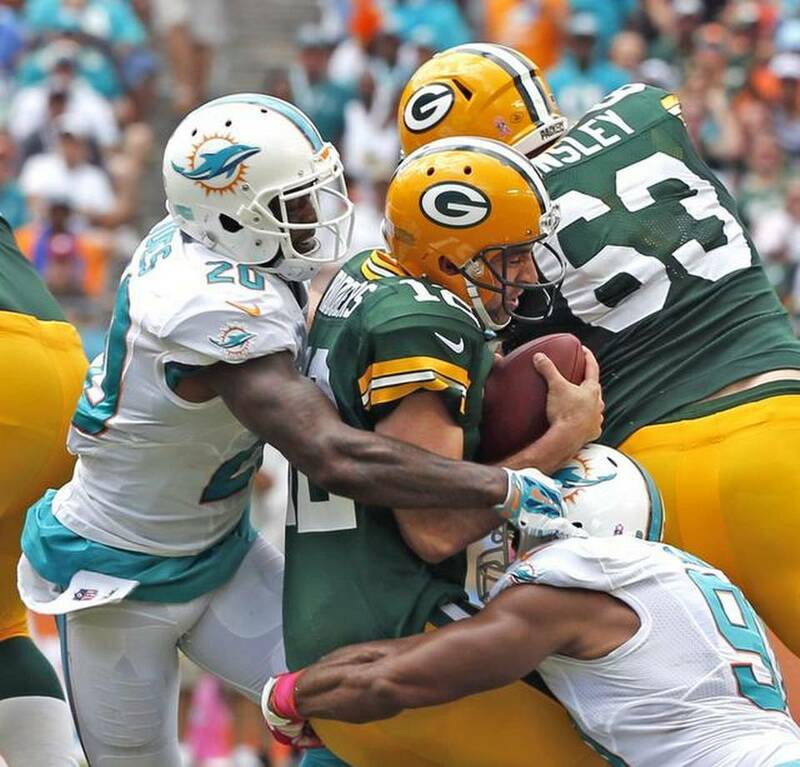 The Packers defense came to play forcing Miami to settle for a Caleb Sturgis. The score now sat at 7-3 Packers. After blocking a punt the Dolphins once again had good, no make that great field position. Unfortunately even after getting the ball down to the Green Bay one yard line they could not find the end zone. Missing out on a scoring opportunity against a team like Green Bay is dangerous. The good news as the quarter ended was that the defense had finally come to play, bad news was the running game was stuck in neutral. Both teams defenses stood tall. The Packers struggled to move the ball and Aaron Rodgers began to feel the effect of the Dolphins pass rush. On the other side Green Bay forced Miami quarterback into two interceptions costing the Dolphins the opportunity to put points on the board. I feel there are three types of interceptions: 1. The receiver simply fell down on his route, offense has no chance. 2. The defense just makes an incredible, highlight-reel kind of play. and 3. The quarterback had no business throwing that ball whatsoever. The first two are forgivable offenses, the third-well the third you want to kill the qb. In this case the defense simply made a great play on a contested ball. It could easily have gone the other way. The Dolphins started the second half with the ball. Ryan Tannehill hoped to erase the memory of the first half quickly. On the second play of the drive he took it himself and ran 40 yards, surpassing the Dolphins rushing total of the first half. Watching this first drive you would never think that this was the same team from the first half. Jarvis Landry caught his first NFL touchdown pass to tie the game. Both teams would trade drives during this quarter leading to a tie game at 17-17 early in the fourth quarter. Rodgers is not simply one of the best quarterbacks in the NFL, he is THE best. On this afternoon Ryan Tannehill showed he could stand toe to toe with the best the NFL has to offer. This is something Tannehill’s critics should remember. Sadly we tend to remember what we saw last. What we saw last was Aaron Rodgers being Aaron Rodgers and the Dolphins defense falling apart when they were needed most. With a 24-20 lead the Dolphins failed to get a first down and gave the ball back to Rodgers with 2:04 left in the game. It would be just enough. There was blame to go around on the last drive. Brent Grimes falling down while covering Jordy Nelson. Cortland Finnegan trying a very lackadaisical tackle of Davante Adams inside the ten yard line. Worst of all was the coverage by Philip Wheeler on the touchdown play. It is not that he got beat by the tight end for a touchdown that will happen. It was that he did not even try to engage Anthony Quarless until he was already in the end zone. By that point he had already lost. If he made contact before Quarless entered the end zone he may have had a chance. It was not to be. A great comeback fell just six seconds short. All of the good things we saw in the second half came of naught. Time to move onto the Bears. Previous Post Patriots not quite done. Great article. I wish more sport writers would write there thoughts during the course of a game instead of pre-game predictions and post-game ( Monday quarter-back ) articles. I think it would sell more NEWSPAPERS. This game was the game of the week. I thought Miami would win. With the heat and the head coach of the Dolphins being familiar with Aaron Rodgers. Aaron Rodgers pulled a Dan Marino in Dan’s house. This journalist was right ” Aaron Rodgers is amazing “. With this win Aaron Rodgers will lead Green Bay to another Divisional Title.